With technology surging ahead on all fronts and smart homes becoming increasingly popular, there’s little now that can’t be automated. The more we have done for us, the more we want done for us. Whether it’s programming the espresso machine to prepare the morning caffeine fix, or barking orders at Alexa to dim the lights and draw the shades, homes are growingly robotized. In today’s best Wi-Fi thermostat reviews, we’ll look at a neat addition to any smart home. Whether you want to slash rampant power bills or enjoy the freedom of controlling the climate inside your home remotely, these nifty little devices are inexpensive and packed with functionality. Then, once you have a solid overview of the leading thermostats on the market, we’ll round out with a buying guide to further simplify your selection process. As with any product, being aware of what to look out for in the best smart thermostat as well as reading frank and honest reviews will place you perfectly to get the most suitable device for the job at hand. 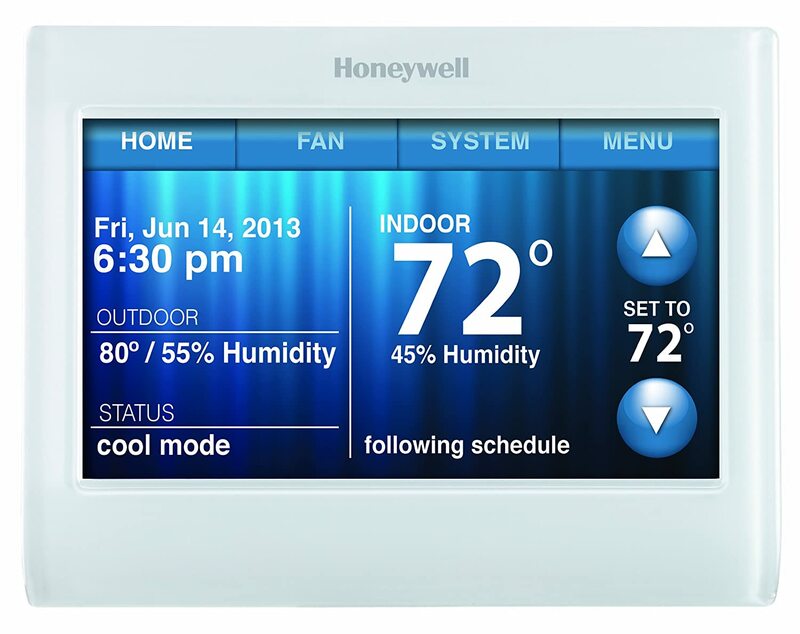 First up in our look at the best Wi-Fi thermostats is the Honeywell 9000. Honeywell launched the 9000 after they claimed the Nest Learning Thermostat, reviewed below, rode roughshod over no less than 7 of their patents. Honeywell went so far as to file a lawsuit back in 2012 with the dispute only resolved – amicably, we might add – in 2016. The companies now share long-term cross-license agreements with the long-standing acrimony put behind them. The first thing we’d warn you about with this Wi-Fi thermostat is that it’s definitely not a cakewalk to install. Few manufacturers make this clear so we’re stepping in to tell you that, unless you’re extremely handy in this area, you’ll need to call in a professional to get up and running. Unless you’re confident of doing it yourself, make sure to factor this into your budgeting. Another caveat is that you’ll really need a C Wire (common wire) to power the unit. Honeywell make no secret of this so make sure you understand this before buying it and risking disappointment if your home is missing this common wire. The LED color touch screen displays everything you need and nothing that you don’t in crisp, high definition. You can even adjust the colors if you want to streamline the device to co-ordinate with your home décor. Time and date along with the temperature and humidity both indoors and out sit neatly on the home screen. Navigating the menu is super-simple. 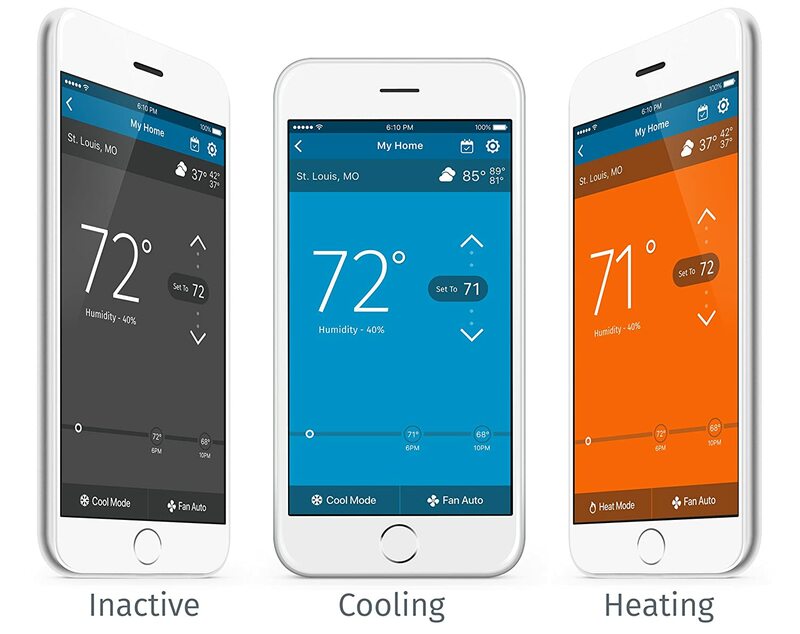 Unlike many thermostats with glitchy or non-existent apps, Total Comfort Connect works pretty seamlessly on both Android and Apple devices. Download this free app with no necessary monthly subscription and you can take care of the temperature at home even when you’re not there. If you have Alexa functionality in your smart home, you can add a Skill and take advantage of your digital assistant to control the thermostat for added scope. Generally, the temperature in an office building or other commercial premises can remain fairly fixed with one setting for business hours and another when customers and employees have headed home. In residential properties, it’s commonplace to make more frequent adjustments. Honeywell foresaw this difficulty so you can choose from Home or Business settings allowing you superior control whatever your requirements. 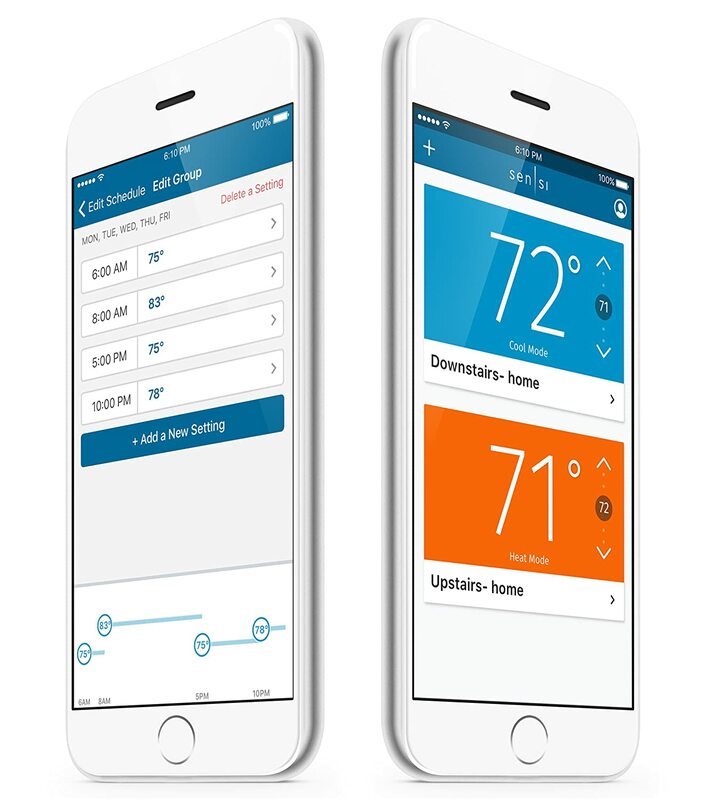 The Smart Response technology in place allows this outstanding Wi-Fi thermostat to become intelligently attuned to the heating or cooling system you have in place and to make necessary adjustments. While this kind of technology is far from perfect at the moment, it’s an encouraging step in the right direction and the future of this kind of smart device. You can take advantage of the locking function as well as insisting on a password if you want to limit control of the thermostat. This is particularly valuable in the workplace if people have a habit of fiddling with the controls to suit their own preferences. At home, it can also safeguard your kids’ meddling attempts! The white frame blends in nicely but there are no extra base plates provided. If you are installing this where a bulkier regulation thermostat was once housed, this might leave some surrounding space that needs attention. If your Internet connectivity drops out, the Honeywell will still continue ploughing its furrow, you just won’t be able to control it via the app. A few users have complained about issues with the Wi-Fi but we have to say it’s pretty stable. There are also some handy alerts you can have sent to any Wi-Fi enabled device allowing you an insight into the general health of your HVAC system. This is a nice touch at this price point. The issues of tricky installation and the requirement for a C Wire are bugbears with most of these WiFi thermostats so it’s hard to knock the Honeywell in particular on these fronts. Setting aside those gripes, there’s little else we can against this excellent and highly adaptable smart thermostat. If you act swiftly, the Honeywell 9000 is currently available at a fairly steep discount so you can save money now as well as on an ongoing basis through dramatically reduced power bills. Next up in our best Wi-Fi thermostat reviews is the Honeywell’s nemesis, the classic Nest Learning Thermostat. Most people don’t buy a device like a thermostat for the aesthetics but Nest makes sure this circular thermostat surrounded by a metal ring has a high-end feel and looks more like an ornament or clock than a functional appliance. Now in its third generation, one of the key differences from the previous iterations is the introduction of Farsight technology. Where the older Nest models would light up if you approached them, this enhanced version will fire up as you enter the room. This is a showboating touch with no particular benefit but Farsight does boast something more useful… If you are tired of seeing the temperature displayed at all times and would prefer the clock instead – or the weather, for that matter – you can tweak what shows up on the display when it’s not being pressed into commission. The screen gives you a visual indication of whether it’s heating or cooling with the display turning red or blue accordingly. The high-def display packs an exceptional 229 pixels per inch meaning you can read things nice and easily even if your eyesight is less than 20/20. Many Wi-Fi thermostats let themselves down with a very narrow spread of compatibility. This is restrictive anyway but a potentially very expensive mistake if you don’t do your due diligence and end up with a device that won’t mesh with your HVAC set-up. The Nest works well with pretty much all regular systems and you can check here on their website to see whether or not you’re in luck. If you have other Nest devices in your smart home, this thermostat will predictably sit very nicely alongside your other equipment. Easy integration is key if you want these labor saving devices to work in your favor not create extra hassle. For Alexa lovers, your favorite digital assistant gels perfectly with the Nest so you can bark out your commands and Alexa will take care of temperature changes for you. Controlling things via the Nest app is a cinch on either iOS or Android. You’ll be able to alter things from a distance using your phone, tablet or laptop and there are no associated monthly costs either. You’ll get full Wi-Fi connectivity with the Nest and there are almost universally positive reports on this front. You’ll get a free Nest account thrown in for good measure. 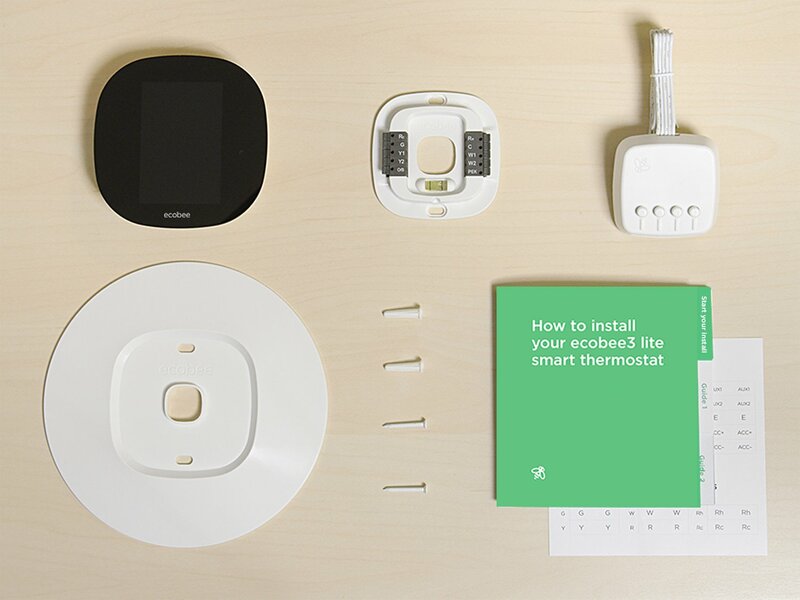 In common with most of the best Wi-Fi smart thermostats, the Nest soon accustoms itself intelligently to your preferred environment and can get to grips with your temperature preferences in around a week. The unit requires a single lithium-ion battery which is not included so make sure you take care of this in advance if you want to get going straight out the box. 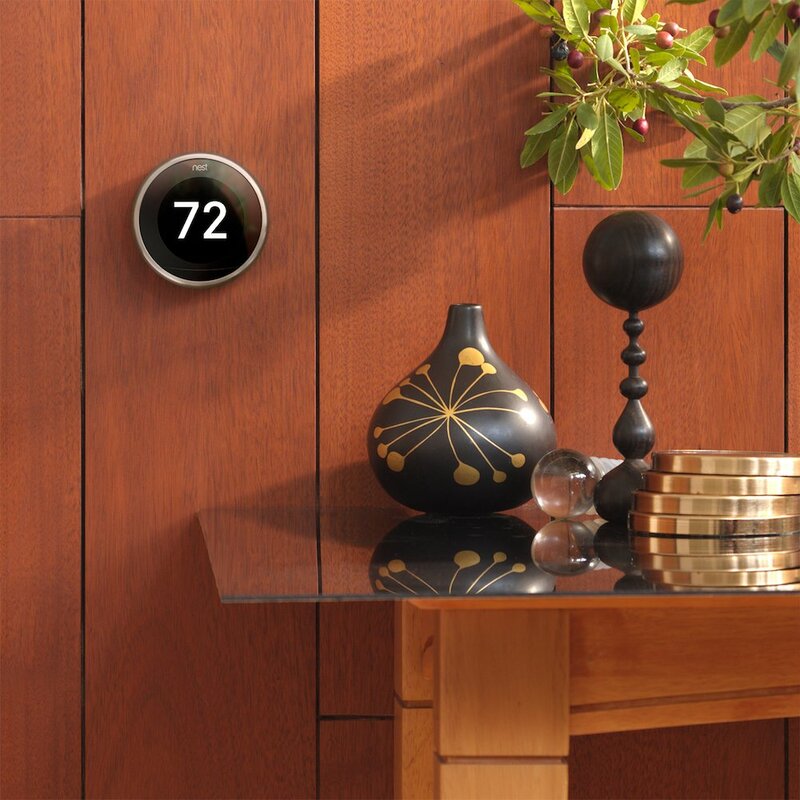 This all-new third generation Nest Learning Thermostat is that rare beast, an uprated model that actually improves on an already strong existing product. As with all these thermostats, the key selling point is the amount of money you can potentially save so focus on that rather than the price tag. Invest to make savings… who wouldn’t want to do that? The Nest has been proven to pay for itself within the first 2 years of purchase so if you’re in any doubt, think of effectively getting the thermostat free of charge thanks to the ongoing cuts you’ll make on injudicious power consumption. Road test the Nest today and you are highly unlikely to be disappointed. Next up, as we reach the midway point in our best Wi-Fi thermostat reviews, we’ve got an extremely affordable model from Emerson that doesn’t hold back on performance. The crowd-pleasing classic Emerson Sensi, around since late 2013, is now available in this new and improved incarnation. And the best news? It’s now even cheaper than ever before so it’s a strong contender for the best budget Wi-Fi thermostat. We have deliberately chosen a selection of thermostats that are widely compatible since a clash can be incredibly frustrating at best and an expensive mistake at worst. Even by the standards of the models we opted for today, the Sensi segues with practically any home system. Go here to see a full breakdown and make sure your heating or cooling set-up is on the list just to be on the safe side. A C Wire is required for heat pump, heat and cool only systems with no aux. In most other instances, the Sensi is designed to work with the wiring already in place. Whether you’re an Apple or Android fan, the mobile app is a capable and worthwhile free addition. You’ll be able to control the environment from inside or outside the house using nothing more than your cell phone. Help facilities are also first-rate, valuable with something as potentially temperamental as a smart thermostat. You’ll be able to get in touch with customer care around the clock and they’re a helpful bunch. In-app, there are plenty of clear guidelines and tutorials to see you on your way. You can control the Sensi in one of two ways… Geofencing is a pioneering system where you the temperature is adjusted through the location of your cell phone. If you’re away from home, it will make necessary alterations to cut back on the heating and prevent waste. The alternative is to take advantage of the weekly flexible programming schedule so you’ve got all bases covered with the Emerson. The display showcases the usual temperature and humidity data to a very tight tolerance. Whether you’re at home or not, you can dial things in to 1 degree and make sure the levels are exactly in line with your requirements. You’ll also get any necessary feedback if your system breaks down in any way which is a nice way to stay apprised of the health of your heating and cooling. While many smart thermostats claim to be simple to install, that’s rarely the case in practice. The Emerson Sensi is truly straightforward to rack up and you should be good to go well within half an hour. A few disgruntled users have reported niggles during installation but conceded that they were promptly resolved. 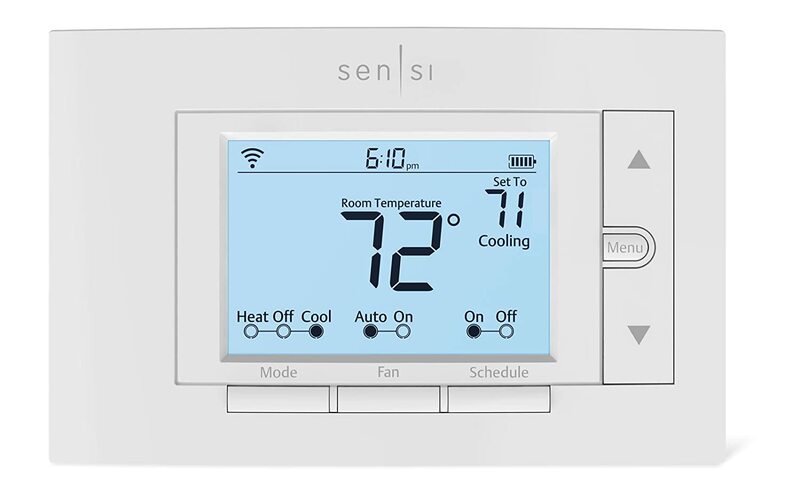 While the Nest Learning is almost the default choice for many looking to upgrade their programmable thermostat to a Wi-Fi enabled alternative, the Emerson Sensi represents a wise move for anyone seeking high-end performance with a decidedly mid-range price tag. Unlike many cheap products, you won’t be dipping out on much by the way of features and functionality either. The Sensi does pretty much everything its more expensive brethren do while coming in at such a keen cost that you can expect to get a return on your investment in as little as a year. 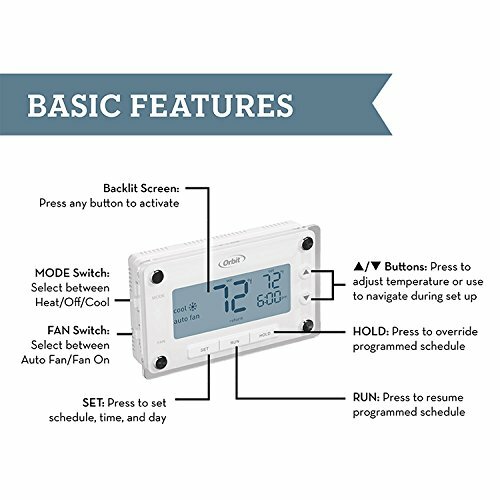 This thermostat was rated as the Best Value smart thermostat by reviewed.com and it’s easy to see why. Give the Emerson Sensi a shot and you’ll be delighted you made the investment when you see your new and slimmed down utility bills. As we draw toward the end of our best thermostat reviews, we’re going to double down on the only non-Wi-Fi model on our list. If you don’t have a C Wire in your home and you’re not bothered about controlling your thermostat remotely, the Orbit makes sense. This attractive unit looks much more expensive than it really is so you’ll no worries about low-quality tat adorning your walls. 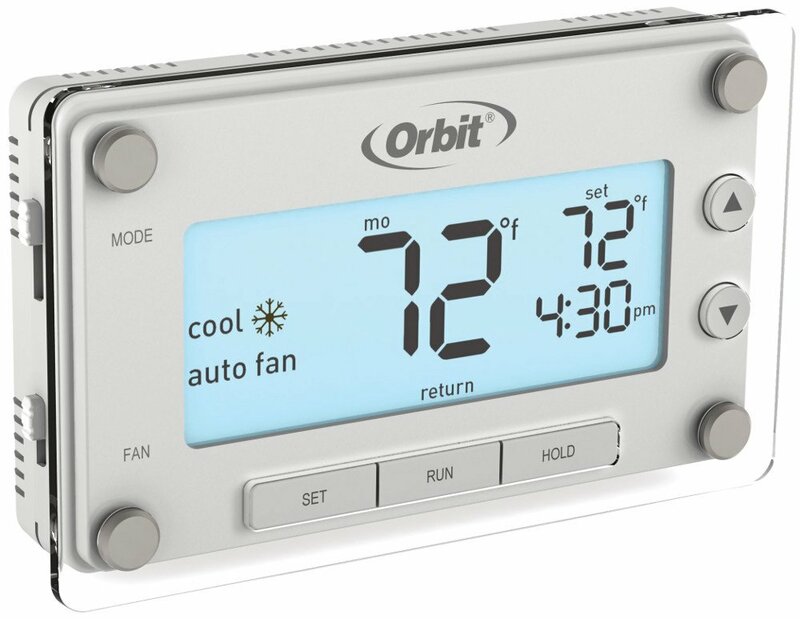 While you won’t be able to make temperature adjustments from your smart phone or laptop, Orbit gets the programming just right and it’s a real joy to use this thermostat. If you think back to wrestling with some of those old units that seem impeccably designed to make things as awkward as possible… well, the Orbit is the precise opposite. With a crystal-clear screen backlit for superior visibility and a nimble navigation system in place, making adjustments couldn’t be much easier. Programming itself allows you to make settings for each day of the week with 4 segregated time zones within each day for added customization. If you love keyboard shortcuts on the computer, you’ll adore the cut and paste option that takes all the tedium out of constantly inputting your desired scheduling. Say goodbye to shuffling to the shower in the freezing cold and harness the Early Start feature to start your day the right way with the temperature that works best for you. Temperature readouts come in Celsius or Fahrenheit and the accuracy is excellent at +/- 1 degree. Compatibility is first-class with the Orbit slotting in alongside pretty much all regular heating and cooling systems with the exception of baseboard heating systems. As ever, make certain it will fit before committing to purchase. It’s astonishing how many people leave negative reviews after failing to do their due diligence and simply buying the wrong product. It bears repeating that if you’re looking for a Wi-Fi enabled unit allowing for changes to made from afar, the Orbit Clear Comfort is not for you. 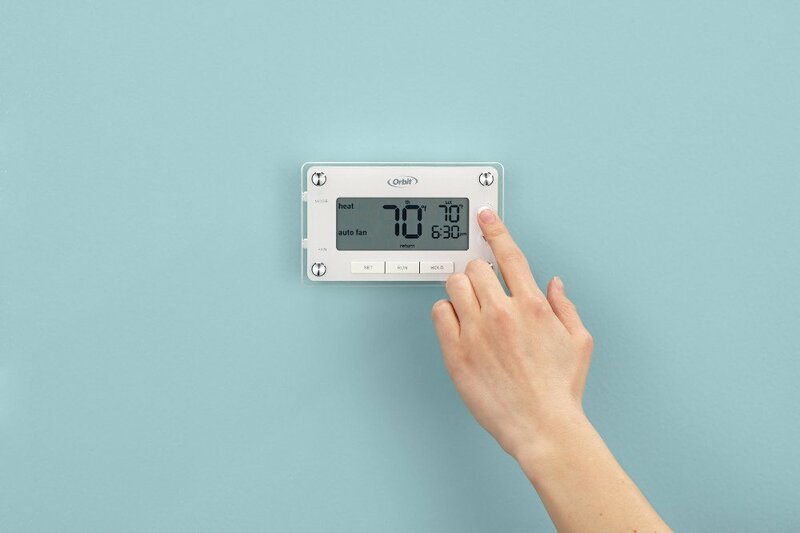 If, on the other hand, you want a simple but highly effective programmable thermostat where everything does exactly what you’d expect at an ultra-low price, you can’t do much better than the Clear Comfort. For anyone who wants a no-nonsense thermostat at an extremely pocket-friendly price, the Orbit Clear Comfort is an absolute must. As with all these thermostats, judicious use of the programming facility can save you a great deal of money each year on your power bills so you could have your purchase price back here within a matter of months. Don’t be mistaken and think you’ll lose out on accuracy or performance either. The Orbit gives you precise readings, offers first-rate programming and even packs smart logic so you can ensure your heating and cooling system is properly looked after. What’s not to like? Give the Orbit Clear Comfort a try and start saving money right now! As we tail off with our Wi-Fi thermostat reviews, we’ve got another extremely well-reviewed favorite, this time the ecobee 3 with Alexa functionality. Perhaps you’d like to pick up the all-singing ecobee 4 but your budget is not quite fluid enough to stretch to it. If so, the scaled-down 3 Lite might be just what you’ve been looking for. If you’re prepared to forego the room sensors, you can get everything else its bigger brother offers without needing to spend quite as much. 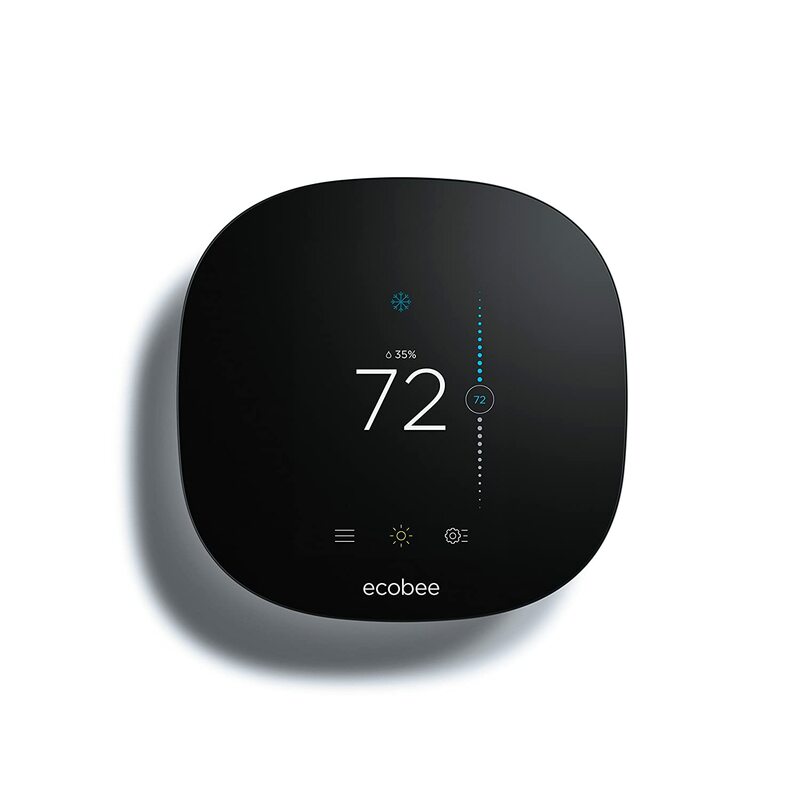 If, however, the sensors that help to eliminate hot and cold spots are something you’d be interested in, we’d urge you to consider the ecobee 4 instead. Adding them to this model is not a cost-effective method so you’re better biting the bullet and getting the 4. Assuming you’re hunting for a bargain, what makes the 3 Lite such a great budget thermostat? The touch screen and interface of any thermostat are crucial. If a manufacturer gets this wrong, the whole experience becomes an uphill struggle. Navigating the ecobee is a breeze with everything feeling beautifully responsive. One key advantage for anyone who finds getting to grips with new technology awkward is the fact the app works very much like the interface of the thermostat itself giving you just one new UI to master rather than a pair. The app itself is also very simple to use. Whether you’ve got iOS or Android devices, an Apple Watch or Amazon Echo with Alexa, you can fine-tune remotely with consummate ease. 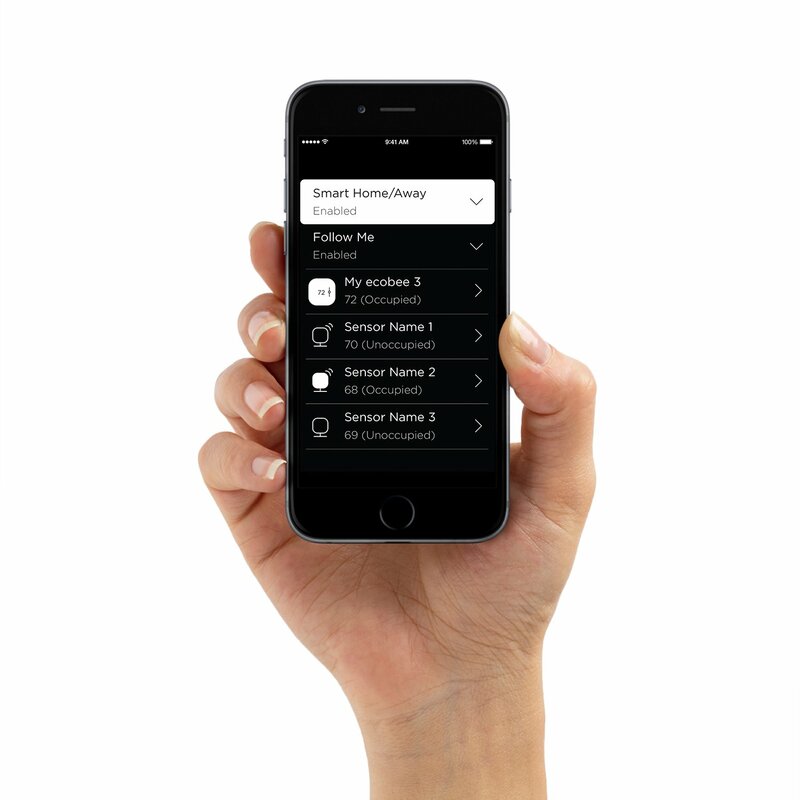 Integration with smart home appliances is equally simple. The breadth of fit is impressive and, whatever smart devices have in place, the ecobee should sit well in its midst. As always, check before to make certain there’s no clash. We mentioned the room sensors which are a wonderful way to see off any rogue hot or cold spots in an area and ensure the temperature is thoroughly regulated throughout. If, perhaps, you’re on a tighter budget now and can’t quite stretch to the ecobee 4, buying this Lite model allows to you to save up and add the sensors at a later date if you choose… Perhaps once you’ve saved the 23% on your power bills suggested by the manufacturer. Check here for a rundown of how those power bills can be cut back with an efficient thermostat in place. The ecobee deals with temperatures from as low as 31 degrees Fahrenheit right up through to 131 degrees when it tops out. That should be a more than ample range for any home or business. The crowning glory is a limited 3-year warranty so you’ll have complete peace of mind in the unlikely event of anything going awry. ecobee is a name you can trust when it comes to WiFi thermostats and the second-generation 3 Lite is an outstanding model which offers a cheaper alternative to the range-topping ecobee 4 at the expense of those sensors which you can add but at a prohibitive cost. As with all of these WiFi thermostats, international shipping can tack an inordinate amount onto the price tag so make sure of the bottom line before delivering. Assuming you order from somewhere closer to home, the 3 Lite is a great way to get the ecobee brand name without digging as deep as you’d need to for the flagship model. We never aim to drive you in the direction of an expensive product when a cheaper one will do more or less the same job. We can’t recommend the ecobee 3 Lite highly enough. It’s a wonderful smart Wi-Fi thermostat at an incredibly attractive price and it will save you plenty of money into the bargain: what’s not to like? Now you’ve had chance to familiarize yourself with 5 of the best Wi-Fi thermostats on the market, we’ll probe a little further into why you should buy one in the first place then what to look for to ensure you get the most suitable device for your home. Why Should You Invest In A Wi-Fi Thermostat? You should absolutely consider money outlaid on a Wi-Fi thermostat as an investment rather than an expense. By adding one to your smart home, you can save money over time and recoup the cost of the device in a relatively short period of time. After that point, you can enjoy constantly reduced electricity bills without experiencing any discomfort to achieve those savings. Look for units that are Energy Star certified and you could start cutting back by 20-30% on your power bills. Given the cost of electricity these days, that’s certainly nothing to be sniffed at. The other leading advantage of a Wi-Fi thermostat, and one linked to saving money, is the ability you’ll enjoy to control the climate inside your home from afar. Whether you have a smart phone or a tablet, an Apple Watch or one of Amazon’s Alexa-packing Echo devices, you’ll be able to fully customize the temperature even if you’re out. 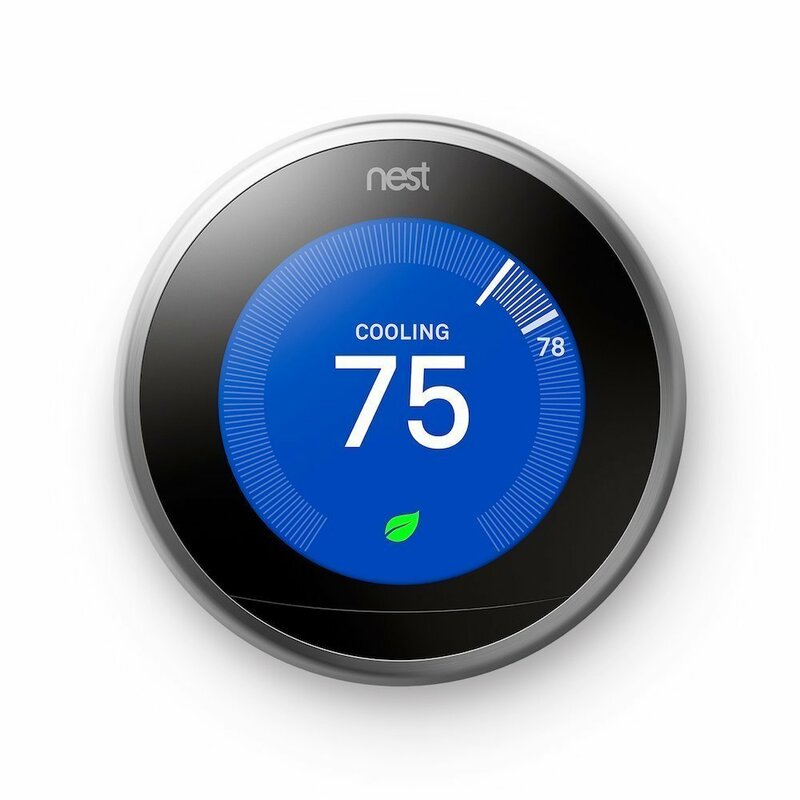 Finally, if you’re already invested in a smart home, most decent Wi-Fi thermostats integrate nicely with all common smart home appliances so you can edge your way toward fully automated living for far less money than you might imagine. 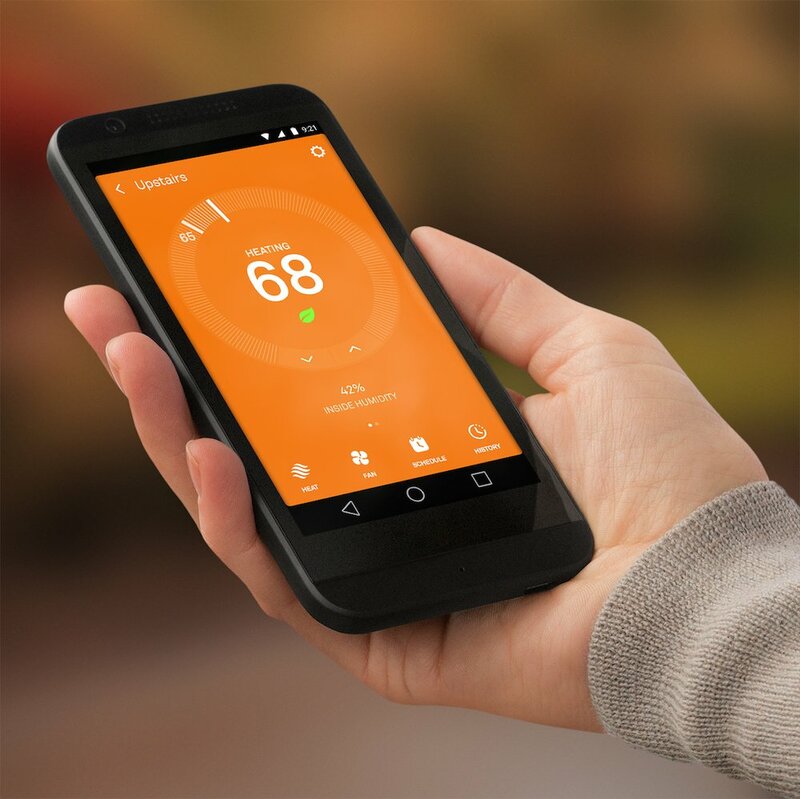 Why Is A Wi-Fi Thermostat Better Than A Programmable Thermostat? If you already have a standard programmable thermostat in place, you might be asking what the point is of upgrading to a smart alternative. Most of these smart thermostats are broadly similar in what they’ll do. After all, their core function is pretty basis so it’s not like buying power tools where there is an enormous array of bewildering options at your disposal. Get this right before you even think about anything else or you could end up with a very expensive ornament. The most commonplace systems these days are central heating and cooling systems that run on oil or gas, 24V or electric. Gas furnaces are noisier and you’ll see the telltale blue flame in the window on the front while electric systems are fairly quiet with no observation window at all. The standard HVAC systems are either 1-stage or 2-stage. The average smart thermostat will support a single cooling and heating systems with multiple stages. Do your homework before purchase. Read up in detail on the models on your shortlist and make certain it’s compatible with your home system. The C Wire or common wire is a low voltage wire that delivers power to the thermostat and allows you to hook it up to your Wi-Fi connection. Older HVAC systems often lack this wire. On other occasions, it may be present but tucked away inside the wall. If you have a C Wire in place, this maximizes your options when it comes to Wi-Fi thermostats and lets you choose from just about any model on the market. If there’s no C Wire in your home, either contract the services of a professional to install one. This is neither expensive nor difficult. Failing that, opt for a thermostat like the Sensi that doesn’t need a C Wire or the programmable Orbit that doesn’t rely on Wi-Fi. If you lead a busy life, constantly coming and going with regular changes to your routine, the programming functionality of the model of thermostat you choose should reflect this. The key here is not necessarily that you need something as complex as possible. You should concentrate instead on aligning your specific needs with the scheduling available. If you hate tech, it doesn’t pay to hunt down a thermostat that is packed to the rafters with complicated settings. If you’re more comfortable navigating detailed menus and controlling affairs from your smart device, take this into consideration and choose accordingly. As with most aspects of any purchasing decision, you should double down on what works best for you rather than expecting a catch-all solution. That way, you’ll get a thermostat that serves you rather than vice-versa. Thermostats range from the incredibly user-friendly to units that would appear to require a PhD for you to operate them successfully. Don’t make things needlessly tough on yourself here. Some products are perfectly simple to test quickly before you buy but with thermostats, the inbuilt flaw is that you won’t really know first-hand until it’s installed by which time it’s potentially too late. To this end, it’s well worth spending the time to sift through as many user reviews as possible. Get a feel for what others think and balance out these opinions on ease of use to get the best fit for you. We can assure that many supposedly DIY thermostats are far from easy to get up and running. Again, look through user-generated feedback and the reviews on online stores so you can see how others have fared with installation. Don’t be put off, though. Many of these thermostats are not at all awkward to install. In our reviews above we make it very clear which ones you’ll have out the box and on the wall and which might require a little assistance. As previously mentioned, the price of the thermostat you have in mind should be weighed against future savings. This can be quite meaningful and amount to reductions of as much as one-quarter off your monthly utility bill. None of the thermostats we review are what could be termed overly expensive but they do range from the extremely cheap to something you might think twice about. We would urge that you do not run over budget, of course. No purchase is worth making yourself financially uncomfortable. That said, consider more than purely the bottom line and, if you hanker after a slightly pricier thermostat, rest safely knowing the investment can be recouped in as little as a year or two. Hopefully, you’ll now be in a position to hunt down and secure the most appropriate Wi-Fi thermostat for your smart home. Reading a range of user reviews is always a good way to get a feel for any product and all the thermostats we outline today deserve a place on any shortlist. We’ve drawn your attention to any shortcomings, too, so there will be no hidden kickers. Drop us a line any time if there’s anything related to home and garden you’d like us to cover here on the site. We’re aggressively developing to deliver you all the advice you need to get the very best products on the market to make your life easier. Now flick on the Wi-Fi and fire up the thermostat and start saving money today!